At any one moment in time these days around 1 billion people are sitting in front of their computers doing stuff online. Indeed, right at this moment you are one of that number as you sit in front of your screen and read this. Before the Internet came along, of course, you didn’t do this. 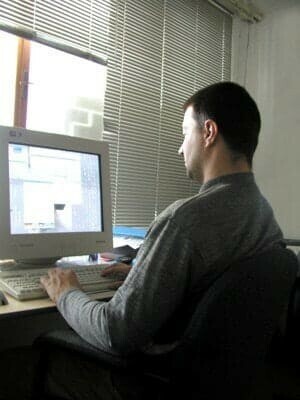 Can you actually remember what you did with all those hours which you now spend sitting in front of a computer screen? The chances are for much of the time you were with other people. Nowadays when we are in offices with other people we are often actually working in isolation; we share the same physical space, but our “world” is the one we inhabit through the computer screen, often oblivious to what is going on around us. There has been much debate as to whether or not this is “good” for us. Now, some new research into specific brain structures suggests that the social isolation which the Internet forces upon us could actually be making us less able to think well. The study looked at the production of myelin, an insulating covering for brain cells; it is what gives us the “white matter” in our brains. And it is important stuff – it ensures the proper conduction of signals in our nervous system. When people lose white matter they can end up with a variety of problems such as blurred vision, speech impairment and memory loss. What this new research found was that when we are socially isolated we tend to make less white matter in the areas of our brain that are responsible for thinking and emotions. It seems that social activity is fundamental to allowing our brains to produce the right anatomy to make us think better. Admittedly, the research was conducted in mice, but it does suggest that social activity and brain structure are linked. Indeed, this has been found in previous studies which showed that the degree of grey matter in the brain is linked to our levels of altruism and caring for others. Now, don’t get too hung up on worrying about the structure of your brain. Instead, think about the practical implications. If you want your business to succeed online you need to ensure you think well and that you are capable of emotionally connecting with your customer base. This research implies that this is much more likely to happen if you spend more time out of the office socialising with people and less time in front of your computer. It is very tempting in the online business world to sit in front of your screen doing more “work” and believing that what you are doing is helpful to your business. However, this research suggests that you could actually boost your business by taking time off from your computer and going out into the “real world”.